A couple of days ago I was talking to a gentleman who lives on an island off Seattle. His name is Stephan Schwartz, and he’s quite remarkable. Dr. Judith Orloff has worked with him on and off over the years, and she put me onto him, as a possible interviewee for my film on intuition. He is a truly amazing man. Stephan A. Schwartz is a Senior Fellow in the Brain, Mind, and Healing Program at the Samueli Institute. He has spent a lifetime of work focused on exceptional human performance, particularly involving aspects of consciousness. Mr. Schwartz’ experimental work began in 1973, when he wrote his first book, The Secret Vaults of Time, a survey of all the research done using the non-local aspect of the mind to locate and reconstruct archaeological sites. Considered one of the founders of Remote Viewing, Mr. Schwartz became Senior Fellow of the Philosophical Research Society in 1976, where he carried out the Deep Quest submarine study, one of the milestone experiments in parapsychology, establishing that nonlocal performance was not an electromagnetic phenomenon. After founding the Mobius Society where he was the Research Director and Board Chairman for the next 17 years, Mr. Schwartz carried out many experimental studies focusing on three main research areas: remote viewing, therapeutic intention, and non-local awareness and its relationship to genius, religious epiphanies, and personality types. From this experimental research he has slowly developed a model for the various kinds of observed nonlocal functioning being an informational process. Seeking to change the materialist reductionism that defined science, Mr. Schwartz co-founded the Society for the Anthropology of Consciousness (SAC), now a unit in the American Anthropological Association, the International Society for the Study of Subtle Energies and Energy Medicine (ISSSEEM), and the International Remote Viewing Association (IRVA), while starting the peer-reviewed journals Phoenix and Subtle Energies. Since leaving the Mobius Society, Mr. Schwartz has pursued his experimental and theoretical work as a Research Associate of the Cognitive Sciences Laboratory of The Laboratories for Fundamental Research, as Director of Research at the Rhine Research Center, as a BIAL Fellow, and as a Scholar-in-Residence at Atlantic University. He is the author of four books, The Secret Vaults of Time, The Alexandria Project, Mind Rover, Opening to the Infinite and the soon to be published The 8 Laws of Change. He has published over 90 papers in peer-reviewed publications, and writes regularly for The Huffington Post, and has been an editorial staff member of National Geographic. He has also written numerous magazine articles for Smithsonian, OMNI, American History, American Heritage, The Washington Post, The New York Times, as well as other magazines and newspapers. Like I say, he’s a remarkable man. He’s probably best known for his “remote viewing” – that is, for his ability to use ESP, Extra Sensory Perception, to see distant objects and people. He has been employed by the US Government and the military, and by commercial enterprises – and has had great success. I spoke to him the other day – and we arranged for me to interview him when I next go to the US, most probably in late October / November. 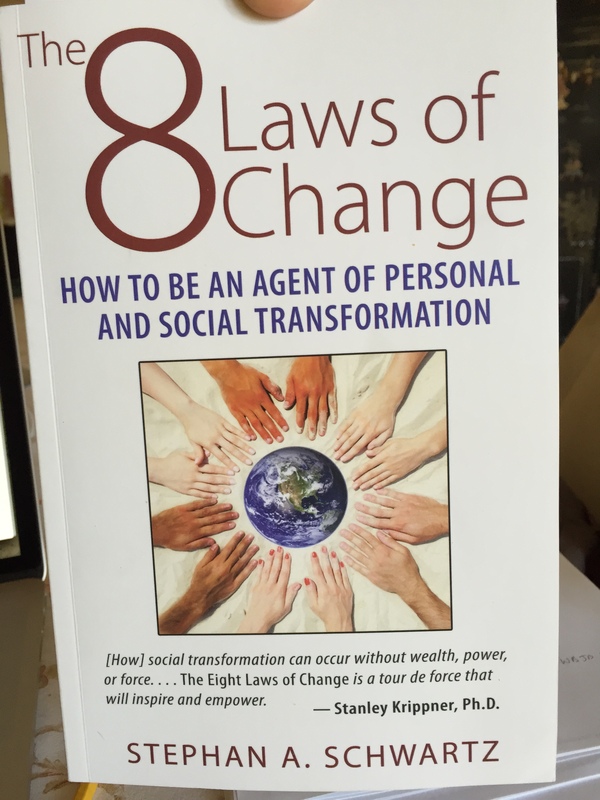 He has a new book coming out in September, called THE 8 LAWS OF CHANGE, which is about how to use integrity and intention in small choices to institute social change. I told him I wanted to read the book, so that I was properly prepared before the interview. He told me it wasn’t possible – the only copy he had was one with corrections which he’d passed on to his publisher, and he didn’t even have a digital file. And as far as he knew, the publisher was yet to have copies to send out. We agreed that I would have to wait until September 25, when it’s published. I then went onto his Amazon page, and went to pre-order a copy, but my PGS told me to hold off. I don’t know why, but I now listen and act on my PGS, and so I didn’t put in the pre-order. The next day I got a copy of his book in the post. There was no attached letter, no sender details on the envelope, I have no idea who sent me the book or how I got it. But it arrived the day after I spoke to him. I put that down to a small miracle. Well, I’m going to be talking to four of them this Friday! Bill I feel strongly that I need this book to help me to progress in my healing work. It will feed me of something that will open a door,to show me what I can do more. I will get it after India,to start a good found back to ,”school”. Thank for sharing all this. Dear Marie – it’s a real pleasure! I’m looking forward to sitting down with you in India and telling you some of the things I’ve learned and discovered since Assisi. Also, my cough has definitely gone. I did a 8km walk with Jennifer this evening, in the cold, and going up hills, and I didn’t cough once. Michael Tamura at Mount Shasta definitely cleared it! For your cough I am very happy,I was preoccupied that it could be more serious. .I am waiting also to hear all the informations and changes that occur after Assisi and during this incredible travelling in America. I have to tell you also about the changes that happened in many life after Assisi and the awakening in front of saint Clare casket.Would all this things have happen without you deciding to walk the Camino and doing a blog about it ? This walk had an impact on your life but also on mine.Big impact. Bill, With all this amazing info and interviews I do not see how you will make it into one normal length movie. It seems you will need a miniseries to cover it all!. I don’t see how you can leave anything out! Kathryn – you’re probably right. We might need to provide separately some extended interviews, because there is so much in these interviews that’s absolutely fascinating, and yet we won’t have time to include it all in the cut of the film.